Today the public schools all were closed for an expected snowstorm. Which never materialized. We had “Winter Weather Advisories”and whatnot in effect today but all we got were about 15 minutes worth of flurries followed by fog and some freezing drizzle. Very disappointing. And good enough reason to not cancel home school. If we had gotten a lot of fun snow I may have relented in the name of outside play, but in this case….no. I did however keep the fireplace on all day and make 2 types of cookies to enjoy with hot cocoa. The first ones were Bakerella’s Cowgirl Cookies. Think chocolate – chip cookies with m&m’s. Tres yummy, and very easy. I also love that she uses melted butter, much like America’s Test Kitchen uses for their chocolate – chip cookies. This keeps the cookie centers moist but you don’t get that all – spread – out – flatness that you get from the Tollhouse recipe. As a side note, I made this mix once before as Gluten – free for a dear friend who cannot have wheat products. I used some of King Arthur flour’s gluten – free flour in place of the all – purpose, and since I could not find any oats that were not reliably free of cross – contamination from wheat I simply replaced them with the same amount of GF flour. They came out great! Neve read two chapters of Laura Ingalls Wilder’s On the Banks of Plum Creek out loud while I baked them up today. Voila. School and cookies at the same time. 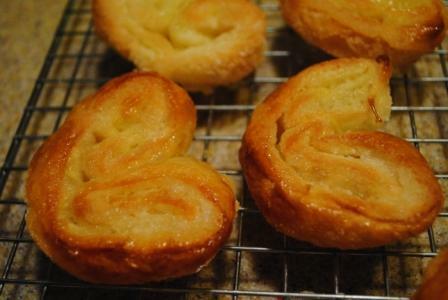 Then this evening after Emily and I finished talking about flower parts and reproduction I made Palmiers, a cookie also often referred to as Elephant Ears. These are likewise incredibly easy to make, an very yummy. They are especially good with afternoon coffee. I used Ina Garten’s recipe from Food Network, which you can find here. Basically, you roll out some Pepperidge Farm frozen puff pastry (thawed!) on a surface covered (and I do mean covered) with sugar and a tad of kosher salt. The pastry itself also gets covered liberally with sugar, then folded up like a book into 6 layers and sliced in small sections to be baked. The sugar caramelizes nicely while the puff pastry expands and “puffs” out. When complete they are the perfect combination of sweet and chewy/crunchy. They take no time at all, which is, incidentally, about how long they last. This entry was posted in Kids and tagged food, Gluten-free. Bookmark the permalink. ‘Kay…I want to go to YOUR school. Yeah, I’m with Marissa. Who cares about snow days when the school management keeps a fire in the fireplace and makes you fresh-baked cookies?